First it was the lotion bar. Then it was the toothpaste. Just last month it was the powdered foundation. Ya’ll, I swear I’m not going full-fledged, tree-huggin’ granola on you, it’s just that my stash of toiletries have come together and planned a full-on revolution on me! At least it feels that way. And with all the label reading I’ve done lately for this post about additives and then this one on food from overseas… well geez, I’m just not sure who I can trust anymore. But there’s something else too. The more I experiment with homemade health and beauty stuff, the more I realize that it’s not that difficult to make. A couple of scoops of this, a pinch of that… stir and voila! The process becomes even easier once you have the recipe nailed down too. (Which is what I’m sharing with you guys… I’m sparing you from the multiple versions of not-so-good toothpaste and lotions – you’re welcome!). Plus making it yourself is WAY more affordable than buying it from the store. I save over 60% on homemade toothpaste and one batch of homemade powdered foundation costs only 30¢ for 8 weeks. I’m just not seeing a downside to any of this… so until I do, I’ll just keep plowing ahead! Next stop on the DIY train: homemade tinted moisturizer. The idea of this recipe hit me like a smack in the face one morning while I was putting on some Olay “specialty” lotion, acquired back in my couponing days. Here I was, liberally rubbing on sodium laurel sulfate JUNK so that I could fight off the tiniest of tiny wrinkles that MIGHT be forming around my mouth so that I could eliminate the evidence of smiling my whole life. All the while, looking forward to “doing my make-up” with my newly created homemade powdered foundation that did NOT have the sodium laurel sulfate JUNK that every other make-up was riddled with. Anyone else see the irony? Yeah, so I ditched that Olay stuff and decided to make my own. I used my original face lotion bar recipe as a starting point and tweaked from there, trying to make it solid enough so that it wasn’t runny and gooey, but soft enough so that I didn’t need to keep a butter knife in my make-up pouch. The color issue turned out not to be an issue at all since the powdered foundation is tailored for my exact skin tone, and I could just scoop some out from that jar. Two recipes from one bowl?! Me likey. I also researched what oils would be great for skin, and Frankincense is touted to help keep your skin radiant. 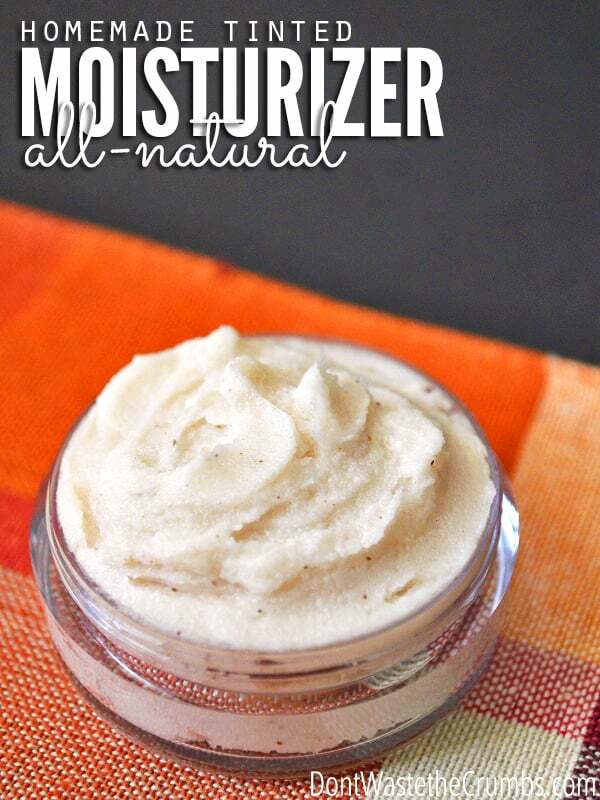 Finally, a homemade tinted moisturizer recipe that’s healthy for my skin! If I could high-five myself, I would! But that would look weird. And kinda nerdy. So let’s talk about this homemade tinted moisturizer instead. First, it’s super healthy – and not just because I made it. Because it’s based on coconut oil, it’s super nourishing for your body. The colors are made from spices in your own cabinet. The essential oils are as pure as well! Nothing fake or artificial about it. Second, a little bit goes a long way. Once you dip/scoop some out, it spreads really easily thanks to your body heat – so merely a pea-sized dollop (or perhaps half of a pea) will cover your whole face. One single batch of the recipe below will last at least a month, but likely closer to two. If it weren’t for the fact that I needed to verify measurements for this post, I would still be working on the same batch I made when I whipped up some toothpaste back in early February. Finally, this takes the “ordinary make-up day” and kicks it up a notch. For me, there are two types of make-up days: church day (which also includes date nights and special occasions) and every other day. I was using just the powdered foundation for “every day” make-up – and that worked fine – but using this homemade tinted moisturizer underneath the powdered foundation makes me feel downright glamorous while browsing the market or cleaning the bathroom! Sold yet? Awesome – let’s do this! Note: I know there are a lot of essential oil companies out there and I’ve certainly tried my fair share of brands. But after testing and researching and more testing, only one is worth spending money on (in my opinion). For a couple years now I’ve been committed to Young Living oils, and you can read more about their oils and my decision HERE. For oily skin, add 5 drops of nourishing oil, plus 1-2 drops frankincense or lavender essential oil. For normal and/or dry skin, add 15 drops of nourishing oil. You can also mix the levels of lavender essential oil and nourishing oils to best suit your skin type. Using a whisk or a spoon, mix well. Allow to cool to room temperature and whip until the moisturizer is a smooth consistency and to ensure there are no clumps of color. If you want a thinner moisturizer, add additional nourishing oils 3 drops at a time, up to 10 additional drops, stirring well after each addition. Spoon into the storage container and store with a lid. Placing the moisturizer in the fridge to speed up the cooling process. I’ve made three varieties of this, each with different amounts of powdered foundation. I actually prefer 3/4 tsp in this recipe, but I am confident that you can add up to 1 tsp if you prefer more color and coverage. I also use the full 10 drops of lavender oil and 5 drops of jojoba oil. This Physicians Formula tinted moisturizer costs $8.99 for a 1.5oz bottle. This is not the top of the line, but it’s not the bottom of the barrel either. It’s a good, run of the mill product that many of us would likely use since it’s an organic product by a fairly reputable company. Are you sitting down? If not, you might want to. This next part could come as a shock. You can make the same amount of homemade tinted moisturizer – customized to YOUR skin tone – for just $1.20. It’s only 80¢ per batch – talk about affordable! 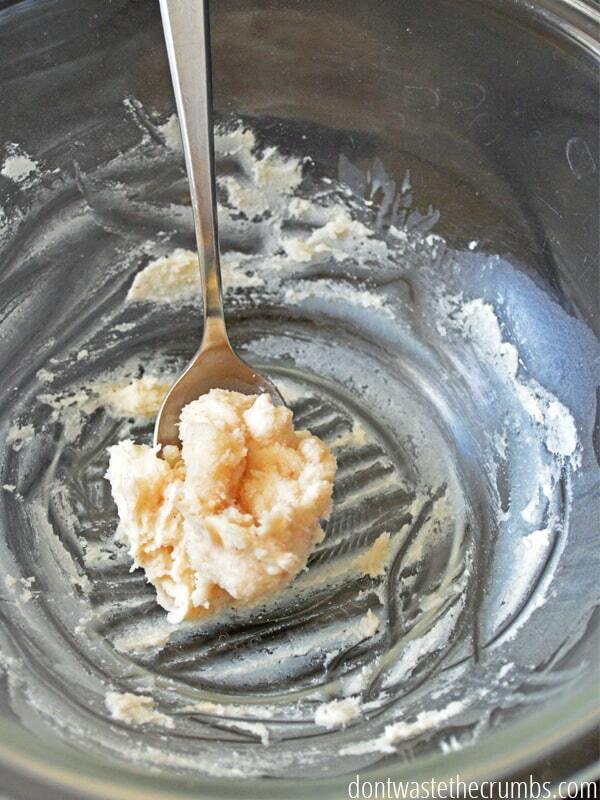 By far, the biggest expense in this homemade tinted moisturizer recipe is the coconut oil. I buy my coconut oil from Tropical Traditions when it’s on sale for 63¢ per ounce, but the key is that I don’t buy it exclusively for this recipe. I use this stuff All.The.Time. in the kitchen. Essentially, there isn’t an additional expense to make this moisturizer – I’m just using what I already have on hand. Hopefully you’re reaping the benefits of coconut oil and have some on hand too! Some of the essential and nourishing oils can be costly up front, which is why I’ve offered a few to choose from. They’re all equally as nourishing, so use whatever you can afford or what you already have. The other oils can be found for a reasonable price both on Amazon and in some local stores. Considering you’re only using 15 drops total and one 1oz bottle can make 590 batches… making one batch each month means one 1oz bottle will last you over three years! To use this moisturizer, use the back of your fingernail to scrape a little out of the tube. Put it on your face and rub over. Your body heat will melt the oil, making it easier to spread as you rub. Another option is to rub the lotion with your finger while it’s still in the container, and then apply to your face. You’re essentially melting a little bit first before applying. I tried this method at first but felt like it was harder to get it out of the container this way. Lavender essential oil will slightly dry out your skin, which is why it’s ideal for oily skin. Because of this though, you will want to exfoliate at least every other day. I keep a washcloth in my shower so every other day when I wash my face, I use the washcloth to gently wash and rinse the soap off. That little effort makes the world of a difference with flaking and drying skin. Mini Plastic Pots: This is what I use. They’re roughly the size of a single eyeshadow container and fit perfectly in my make-up bag. One batch of this recipe will fill two pots and because they’re plastic, I’m not concerned about glass breaking during traveling. Small Glass Jars: Each jar is 4oz, so you’ll have to make at least two or three batches of moisturizer to fill a entire jar. I wouldn’t recommend this option, but it will work if that’s what you have on hand. Mini Glass Jars: Similar to the small glass jar, except that each jar is only 2oz and comes with a plastic lid. This would be much better suited for a single batch. If you live in a very warm climate, you will want to keep this in a somewhat cooler place. Coconut oil solidifies below 76F, but adding the additional oils reduces this temperature just a bit. I keep mine in my make-up bag, under the bathroom sink and that seems to do well. So… do I sound crazy when I talk about making my own tinted moisturizer? Is this something you would consider doing? j’ aime cette approche du “faire soi-même ” mais aussi de ce qui est économique pour le budget familial. Cette attitude de consommer moins mais pour aller vers de la qualité me plaît. Et puis, on sent une vie “réelle” et pas que l’esthétique d’un blog. Is this makeup sun protective at all? How can I add a sun protection to it?? Hi Polly! A reader recently pointed out to me that coconut oil is a natural sunscreen, although I’ve only read one article and can’t completely wrap my head around UVA/UVB rays and Vitamin D absorption and how it all works together. If you’re concerned about sun protection, my suggestion would be to find a regular sunscreen that you feel comfortable with and add the powdered foundation to it, rather than add the sunscreen to the moisturizer. Thanks to you my face smells absolutely delicious! LOL – you’re most welcome Hanna! Thanks for the tip Denise!! I have a question about the coconut oil. Coconut oil is known to clog pores of the skin, it made me brake out heavily when I used it on my face. Is it possible to change the CO with another oil? And it is wrong to call this a moisturizer, all the time it only contains oils. An oil is not moisturizing, it can only seal in the moisture that’s already in your skin. To actually be a moisturizer, it has to contain water. Hi Katy! Different oils have different effects to different people. Coconut oil doesn’t clog my pores, but I’ve heard the opposite for others (like yourself). You can try using a different oil, maybe olive oil, jojoba oil or vitamin E oil, but I don’t if the color would come through as well. You’re welcome to try though and let us know how it goes!! And thank you for the encouragement!! You mentioned in another post on your natural skin care routine for acne that you recently started adding Redmond clay to this tinted moisturizer. I am so excited to try this combination!! How much Redmond clay do you add to each batch? How much does this make? And how often do you remake this? I might even double the recipe so I don’t have to make it again. 🙂 Seems to be a great recipe, I’m going to try it out. I would love to use coconut oil more in my beauty routine, but in my house in the summer (because we don’t run the a/c very cold) it always becomes liquid. I use it in the bathroom, not the kitchen, so keeping it in the fridge isn’t exactly convenient, plus then it solidifies TOO hard… have you encountered this problem? Hi Ann! We live in a very moderate climate where it doesn’t really get too hot. I have not run into this issue myself, but maybe keeping it in the fridge and pulling out first thing in the morning (putting away either when you’re done, or at night) could help a little bit? Hi Jamie! I have a couple questions to help you trouleshoot. First, did you start with regular coconut oil, or fractionated coconut oil? Fractionated coconut oil will always be liquid where non-fractionated (it’s regular, and won’t have “fractionated” on the label) will become solid at 76F or so. When you add the spices and EO’s, it allows the oil to be semi-soft instead of rock hard at cooler temps. Depending on the temperature your house, the lotion could be solid or liquid I guess. Our apartment is around 65 and mine is always solid. In California when it was warmer, it was very soft. If you don’t like the consistency, you can add shea butter or cocoa butter in very small amounts until you reach what you like. Both are softer than coconut oil, but you will need to melt them first and then let them firm up in order for the lotion to be consistent. Your posts have me very excited to try some beauty products of my own 🙂 Having dealt with acne most of my life though, I’m nervous to try coconut oil on my face. Have you received feedback from readers who have tried this recipe? Hi Julie! The only feedback I have on this recipe is good feedback, but I have had some readers say that their skin doesn’t fair well with coconut oil, yet others say it does. I struggle with acne too, and have no issues with coconut oil. I would try applying it plain for a few nights before bed (just a little though, it goes a long way) and see if you have any reactions. If not, go full speed ahead! You mentioned in the beginning of this post that you have a moisturizer for oily and dry skin. How would I adjust this recipe for dry skin? Thanks! Hi Tiffany! Just a quick question…do you buy the gold label coconut oil or we can use the cheaper one, the pure coconut oil (talking about the tropical traditions brand)? Thank you in advance for your reply. Man, I have the opposite problem. When I put coconut oil on my face overnight, I wake up with dry skin. And I’m an oily skin person. I am also using bend soap company’s tea tree goat milk soap too. I think the combo is too drying for my skin. I’m still thankful for this blog post though, because it helped me step away from expensive face products and discover other great, natural products. I just want a moisturizer…can the powder be eliminated? How do you make it more pink? Hi Jody! Cloves are slight pink and if you use them, cut back on the cocoa. Paprika can also help with pink. I just came across this on pinterest and as I’m not a makeup wearer, I’m wondering… Can I simply omit the powder and still have a good moisturizer? Yes! I actually used to use plain coconut oil as a moisturizer before I made this tinted version! I’ve been tired of using traditional foundation on my face & tired of spending money on primers & tinted moisturizers that don’t last long & that I don’t like. I have been making my own powder foundation for a few years, but I wanted to try your recipe so this morning I made both your powder & tinted moisturizer. I was afraid the moisturizer would be too greasy although I love anything with coconut oil so had to try it. LOVE LOVE LOVE IT!!! The powder over the tinted moisturizer works great & feels light & natural. Exactly what I was trying to achieve! Thank you so much for sharing your recipe! I feel NATURALLY BEAUTIFUL! I can’t seem to wear oils on my face in the day, because my mascara and liner just melt down under my eyes. Any suggestions? Have you had this problem with oil-based moisturizers? Me too! This has been driving me nuts! Korinne & Julie – I haven’t had this problem with this recipe. I’ve been used it daily for nearly a year, and mascara almost daily. By the time I apply concealer and powdered foundation, all is good!! I’m sorry this didn’t work for you Katie. It sounds like you ran into a couple problems – next time, I’d recommend blending the spices together in the blender first to get a finer grain, as well as adding more for a darker tint. Then, only use a pea-sized amount on your face. A little bit of coconut oil goes a long way! Tiffany, I have to say, I just found your blog yesterday and can’t stop reading through it! I’ve got tons of ideas from your beauty product recipes to your meal planning and your how to grow lettuces in water article… I haven’t been on the essential oils side until now, but your recipes are driving me to a closer search. Thank you! You are awesome sharing your experiences with us! Aw, thank you so much Mariana! This comment totally made my morning. Blessings to you and your family!!! Thank you for the recipes… very helpful. I like the homemade powder better than my store bought powder!! (I used Frankincense e.o. for mature, sensitive skin) I’ll be making the moisturizer today…these recipes will help me save a boatload of money; in the past, I’ve had to buy hypoallergenic make-up because I was probed to fever blisters and weird breakouts. Not anymore…WHOOOO!! BECAUSE I HAVE OILY SKIN NORMALLY I AM IN IN THE PROCESS OF MAKING A MATTIFYING MOISTURIZER AND WAS WONDERING IF I COULD REPLACE THE COCONUT OIL AND USE THE MATTE MOISTURIZER INSTEAD FOR THE TINTED MOISTURIZER RECIPE? Hi Vanessa – I haven’t tested that myself, but you’re welcome to try! I’m currently cooling my moisturizer in the fridge, but I noticed one problem. IN order to get the powder foundation to not be too light I had to add a fair amount of spices. Only trouble is when I add this mix to the coconut oil it darkens several shades. I’m interested to see if it works but have a feeling it makes a better artificial tanning lotion than a tinted moisturizer. Tips on this? Thank you. Hi Tiffany, I’d like to make a non-tinted version of this–do you think it would work to sub the homemade tinted foundation powder with 1/4 tsp bentonite clay? Or should I also be adding arrowroot powder and such as well? Thanks! Hi Margaux! You can definitely sub bentonite clay for the foundation powder. You *can* add arrowroot powder, but it would only be to help thicken the moisturizer up a bit. If you’re okay with it being quite soft, just the clay would be fine! Thank you so much, Tiffany! I appreciate the response. I also just bought goat milk soap from Bend Soap and I’m super excited about it, thanks for the recommendation! Do you recommend any particular brand of sweet almond oil? One of the brands on Amazon says “hexane free”. Is that something I should look for? Thanks! I love your logic. 🙂 This + zinc oxide for tinted sunscreen would be EPIC as well ! I created a brow pomade with coconut oil but I wouldn’t would Ike it to be a little more matte. Do you have any tips to matte the formula more? I’m sorry Shaina – I’ve never made a brow pomade before!